I have been in Austrialia for holidays in the last couple of weeks and I had a decent running streak.. but after few days I noticed that my left knee was painful in the inside. Pretty sure that such kind of pain was caused by the shoe being worn-out and tilting inwards, but I was with no spare and I had to be back home for a check. 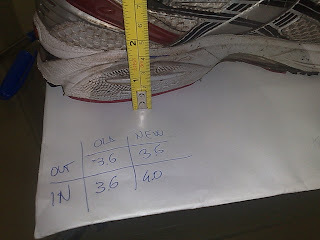 Once home, I took the "old shoes" (a pair of Kayano 14) and and a new pair of Kayano 14 in my stock... same shoes, the one did maybe around 600-800km and I had not used them for the whole 2009..
so the "old" left shoe had lost 4mm of thickness only in the inside!! Given a width of 90mm, it give a tilt of 2.5 degrees (if I still remember well trigonometry...).